Confirms the minutes of the meeting of the Regional Transport Committee, held on 19 June 2018, as a true and correct record. Notes that New Zealand Transport Agency will be writing to Tasman District Council requesting it to include “Safe Enhancements Programme on the State Highway Network” into its Regional Land Transport Plan as a matter of urgency. On Tuesday 19 June 2018, commencing at 10.38 a.m.
Receives and accepts an apology from Councillor Noonan. Document number M3453, agenda pages 6 - 10 refer. Confirms the minutes of the meeting of the Regional Transport Committee, held on 26 April 2018, as a true and correct record. Document number M3407, agenda pages 11 - 28 refer. Receives the unconfirmed minutes of a meeting of the Regional Transport Committee, held on 10 April 2018 and reconvened on 11 May 2018. There was no Chairperson’s report. Document number R9325, agenda pages 29 - 146 refer. The Group Manager Infrastructure Alec Louverdis presented his report and tabled document A1994391. The meeting adjourned at 10.51 a.m. and reconvened at 10.56 a.m.
Mr Louverdis answered questions about the resourcing of the process for the three projects that would be consulted on separately as a variation to the Nelson Regional Land Transport Plan 2015-2021. Approves lodging the amended Nelson Regional Land Transport Plan 2015-2021 (Mid-Term Review) and 2018 Regional Public Transport Plan (A1962674 of Report R9274) with Council for approval. Approves the revised Nelson Regional Land Transport Plan 2015-2021 (Mid-Term Review) and 2018 Regional Public Transport Plan (A1942674 as per Report R9325) for submission to the New Zealand Transport Agency prior to 30 June 2018. There being no further business the meeting ended at 11.19 a.m.
1.1 To approve varying the Regional Land Transport Plan 2015–21 (Mid-Term review) (RLTP) to include the Noise Improvement Programme and Safe Enhancements Programme on the State Highway Network. 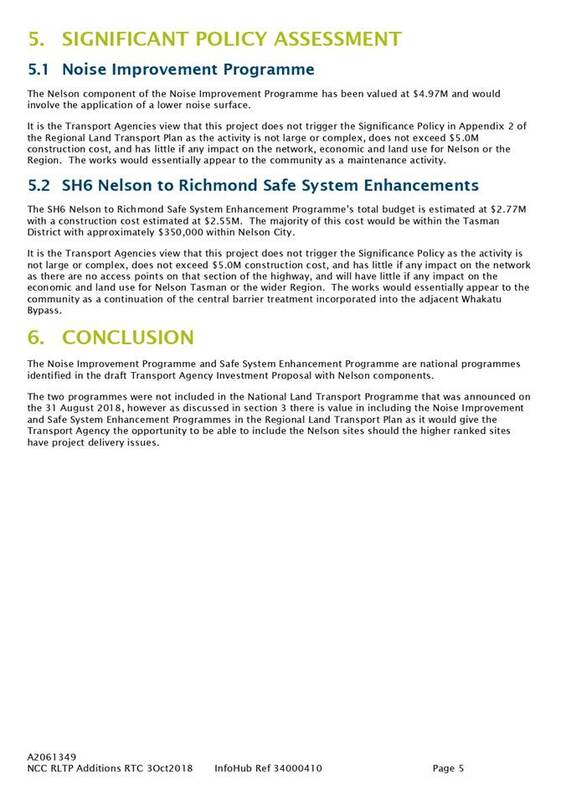 Approves that the Nelson Regional Land Transport Programme 2015-21 is varied to include a total of $4.97M for “Noise Improvements” and $350,000 for “Safety Enhancements on the State Highway Network” spread over the 2018-21 financial years. 3.1 In June 2018 the Regional Transport Committee (RTC) submitted to the NZ Transport Agency (NZTA) the RLTP (Mid-Term Review) that detailed its funding priorities for the next three years. 3.2 At that time NZTA had advised that three further projects (Noise Wall and Improvement Programme; SH6 Nelson to Richmond Safe Systems Enhancements and Active Road User Corridor Programme – Nelson Safer Corridor) might receive funding under its revised draft Transport Agency Investment Proposal (TAIP). These three projects had not been included in the draft RLTP that was consulted on. 3.3 Legal advice at the time was that these projects could not be included in the RLTP as insufficient detail was available for those projects but that once details of the projects were known that they could be assessed together with any implications for projects already in the RLTP, and any necessary changes to the RLTP to include those projects could be processed in accordance with section 18D of the Land Transport Management Act 2003. 3.5 A workshop was held on 4 September 2018 to provide more information to the RTC members on the Noise Improvement Programme and Safe Enhancements Programme. 4.1 The Nelson component of the Noise Improvement Programme has been valued at $4.97M and involves application of a lower road noise surface. 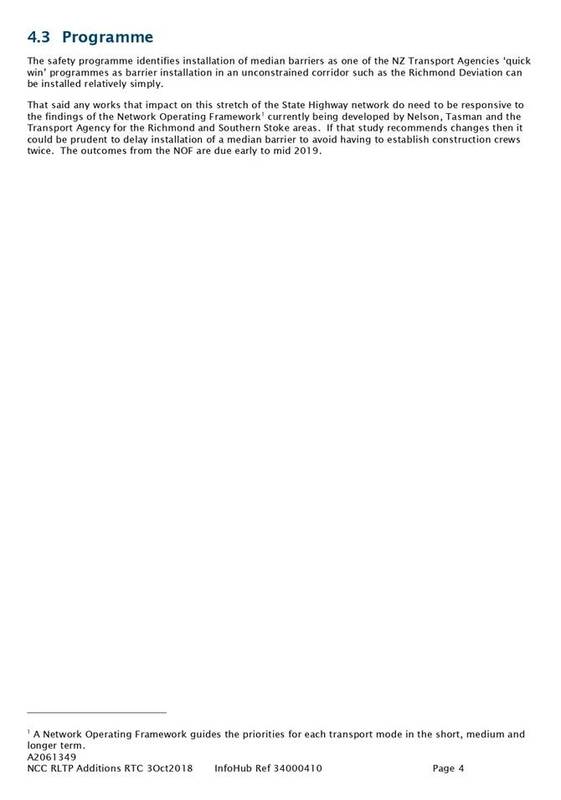 Further detail is provided in Attachment 1 prepared by NZTA. 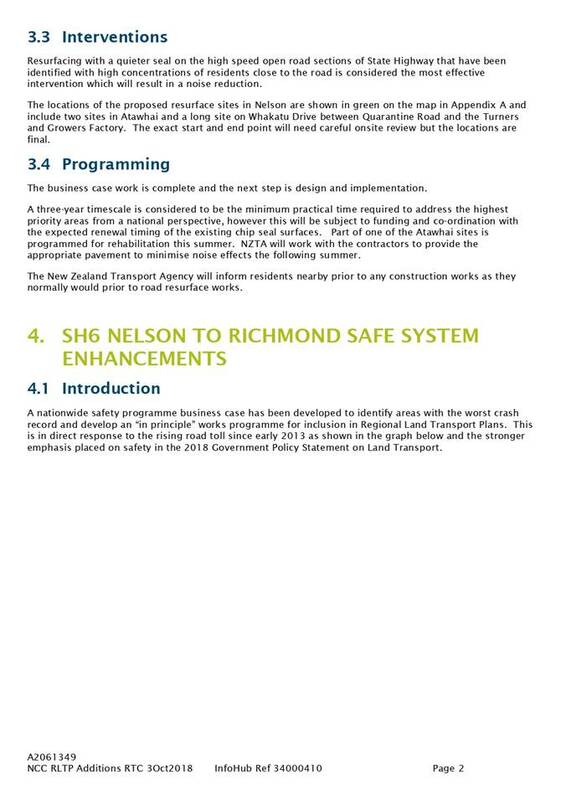 4.2 The SH6 Nelson to Richmond Safe System Enhancement Programme’s total budget is estimated at $2.77M. The majority of this cost would be within the Tasman District Council (TDC) with approximately $350,000 within Nelson. 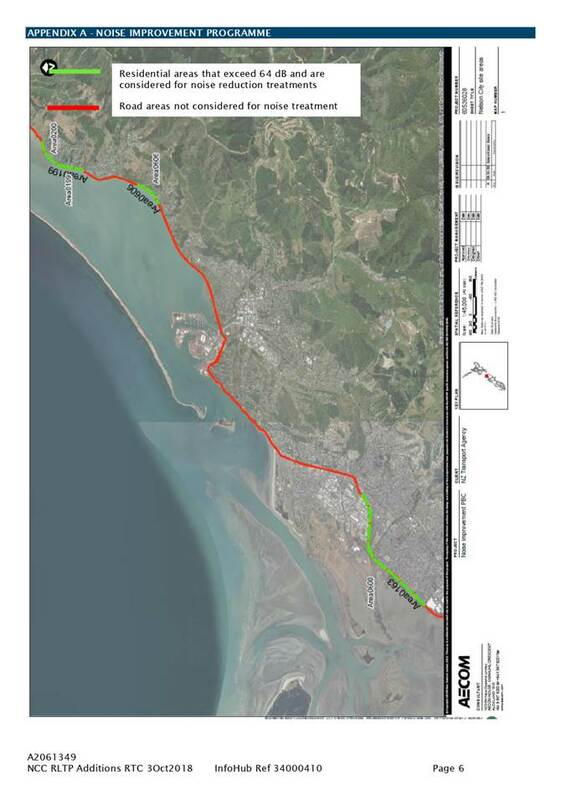 The works include the continuation of the central barrier along the Whakatu Bypass. Further detail is provided in Attachment 1 prepared by NZTA. 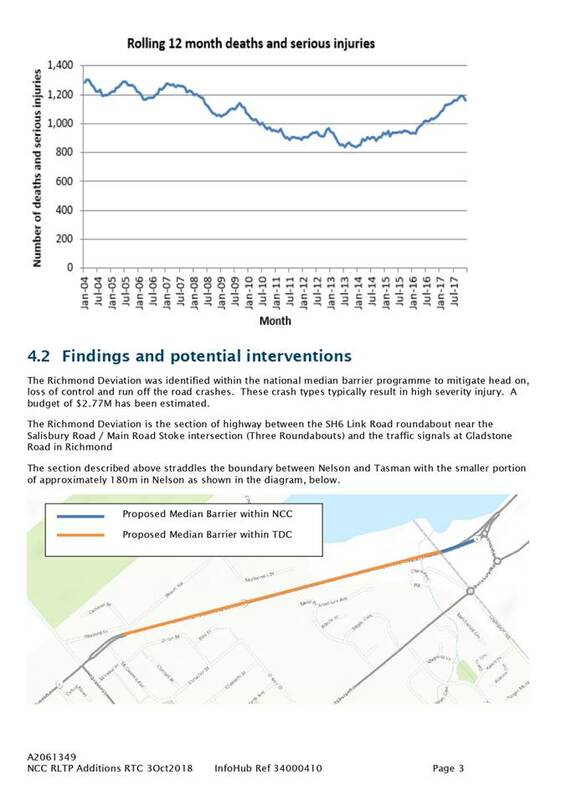 4.3 The Active Road User Corridor Programme is not proposed to be included in this variation of the RLTP. The programme outcomes will be through the Nelson Southern Link Investigation Detailed Business case which has been identified in the NLTP in the 2018/19 and the 2019/20 financial years. The scope of work is currently being confirmed. 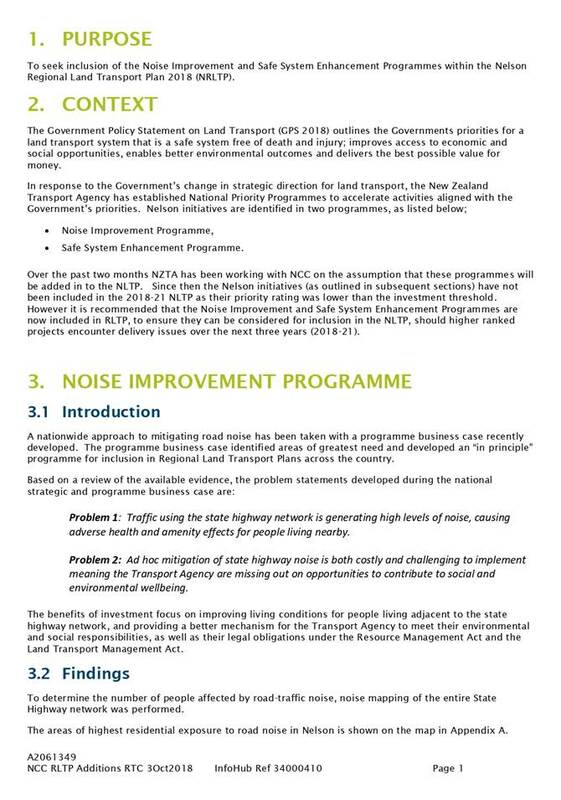 4.4 The Noise Improvement programme and SH6 Nelson to Richmond Safe System Enhancement Programme are both below the $5M significance threshold and the additional detail provided by NZTA is deemed to be sufficient to include these items in the RLTP without the need to go out for public consultation. Providing an RLTP is a requirement of the Land Transport Management Act 2003. The development of an RLTP contributes to the community outcome “Our infrastructure is efficient, cost effective and meets current and future needs”. The RLTP must align with the Draft Government Policy Statement (GPS). Risks associated with making variations to the RLTP and any consequential changes are mitigated by changes being processed in accordance with section 18D of the Land Transport Management Act 2003. The two projects in question are NZTA State Highway projects and will have no effect on the LTP or rates. The $5M significance level has not been trigger by either of the proposed variations for “Noise Improvement Programme and Safe Enhancements Programme on the State Highway Network” so consultation is not required. “To prepare a Regional Transport Plan, or any variation of the Plan, for the approval of Council”.